The GtkPrintUnixDialog implementation of the GtkBuildable interface exposes its notebook internal children with the name "notebook". Example 41. A GtkPrintUnixDialog UI definition fragment. Gets the current page of the GtkPrintDialog. 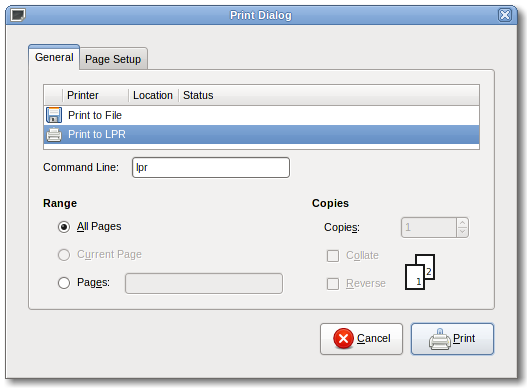 Gets a new GtkPrintSettings object that represents the current values in the print dialog. Note that this creates a new object, and you need to unref it if don't want to keep it. This lets you specify the printing capabilities your application supports. For instance, if you can handle scaling the output then you pass GTK_PRINT_CAPABILITY_SCALE. If you don't pass that, then the dialog will only let you select the scale if the printing system automatically handles scaling.